Cataract is a clouding of the eyes lens. Adults with diabetes are 2-5 times more likely than those without diabetes to develop cataract. Cataract also tends to develop at an earlier age in people with diabetes. Glaucoma is a group of diseases that damage the eyes optic nerve the bundle of nerve fibers that connects the eye to the brain. Some types of glaucoma are associated with elevated pressure inside the eye. In adults, diabetes nearly doubles the risk of glaucoma. Mild nonproliferative retinopathy. Small areas of balloon-like swelling in the retinas tiny blood vessels, called microaneurysms, occur at this earliest stage of the disease. These microaneurysms may leak fluid into the retina. Proliferative diabetic retinopathy (PDR). 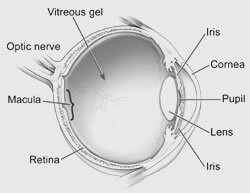 At this advanced stage, growth factors secreted by the retina trigger the proliferation of new blood vessels, which grow along the inside surface of the retina and into the vitreous gel, the fluid that fills the eye. The new blood vessels are fragile, which makes them more likely to leak and bleed. Accompanying scar tissue can contract and cause retinal detachmentthe pulling away of the retina from underlying tissue, like wallpaper peeling away from a wall. Retinal detachment can lead to permanent vision loss. The early stages of diabetic retinopathy usually have no symptoms. The disease often progresses unnoticed until it affects vision. Bleeding from abnormal retinal blood vessels can cause the appearance of floating spots. These spots sometimes clear on their own. 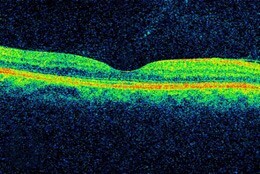 But without prompt treatment, bleeding often recurs, increasing the risk of permanent vision loss. If DME occurs, it can cause blurred vision. Pupil dilation. Drops placed on the eyes surface dilate (widen) the pupil, allowing a physician to examine the retina and optic nerve. 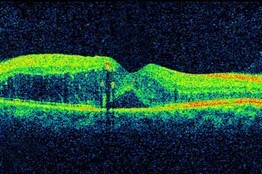 What if treatment doesnt improve vision? Stop struggling with your eyesight! Now is the time to schedule your free LASIK consultation with Dr. Bryan and Dr. Shaw at Carolina Ophthalmology and find out if you’re a candidate for laser vision correction. Why not take our Self Evaluation Test to get started?